Browsing dock options available for Apple Watch, it’s hard to tell the difference between the $50-$100 products and similar looking options from smaller brands that sell for $15 and up on sites like Amazon. I might not have picked this $15 Poetic charging dock out of fear the low price tag meant much lower quality than the more expensive products, but I’m glad the company sent one over to review. The all aluminum dock has the iMac stand look and comes in space gray, gold, or silver to match the iPhone colors (my review unit is the space gray model).The anodized aluminum is much thicker than I expected from such an inexpensive product. The arm that holds the Apple Watch wouldn’t flex much when applying pressure with my hands, and the stand is sturdy and heavy enough that there wasn’t much concern over tipping or wobbling. The other material you see is only a padding on top of the aluminum, a super soft TPU covering that protects the watch and your iPhone from scratching against the aluminum. Another nice touch for a product in the sub $15 category. And beyond the build quality, the dock considers something a lot of other stands on the market didn’t: viewing angles. It’s nice to be able to view your Watch while on the dock, but even more important is a nice angle for the iPhone so you can use it while docked. And it’s nice if you plan on taking advantage of the upcoming Nightstand mode for Apple Watch or using your iPhone for the same purpose. Set-up is easy. You just need to insert your Apple Watch charging cable into the TPU lined opening on the arm of the stand, while an opening just below lets you organize and direct cables out of the back to keep out of sight as much as possible (like most desktop computer monitors have). But for now that’s a compromise for all docks until Apple officially launches its new program that gives accessory makers the ability to integrate charging connectors into products. The stand can accommodate an iPad (mini or otherwise), but it’s not designed to hold the larger iOS device so expect the iPad to block your view of the Apple Watch’s display. It did, however, come in handy when I wanted to view my iPad display at my desk and not have to use a separate stand. There’s also enough room on the flat base of the stand (also covered in the soft TPU covering) for an iPhone to rest while the stand is in use by my iPad, and you can use that for other small items when the iPhone is in the dock. The iPhone dock will also work nicely with a case on your device. My iPhone 6 fit nicely with this Nodus wallet case on and it’s not the thinnest case on the market (although it is a really nice, slim wallet case). 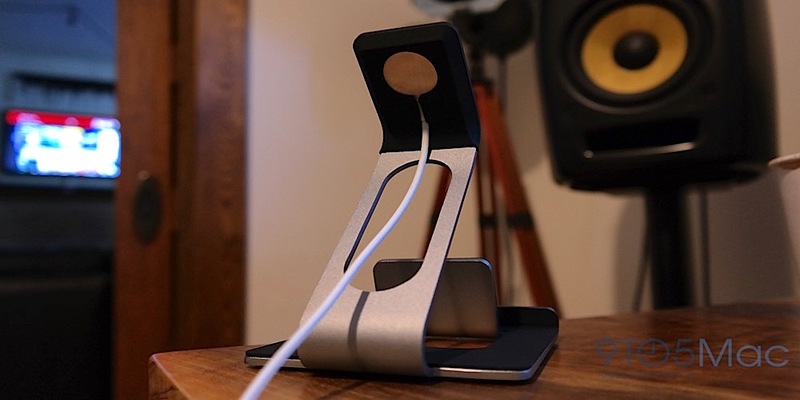 But the Poetic stand is actually a thoughtful design in terms of hiding cables. With the position of the iPhone underneath the Apple Watch and with both devices centered on the stand, the cables are at least hidden behind the devices while running directly out of the back of the cable management opening in the stand’s arm. Should you wait for docks with integrated charging cables? Why wait? 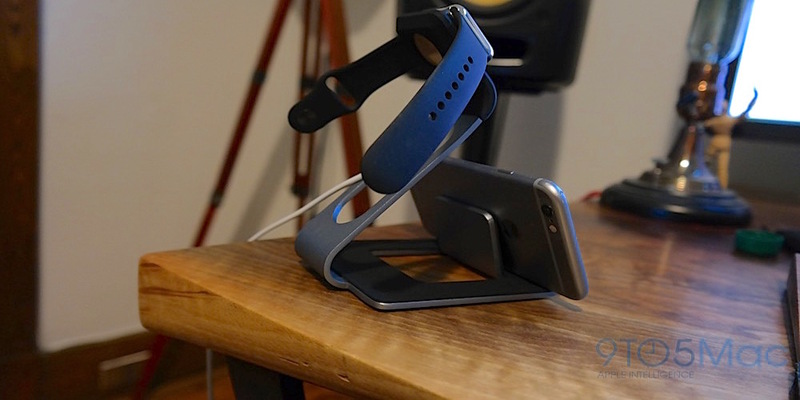 For $15 you can have a sturdy, polished stand that works as both a stand and/or charging dock for both your Apple Watch and iPhone. It certainly gets the job done and does so in a much more thoughtful way than a lot of other docks on the market. And at $15, you don’t need to worry about already having blown your budget for accessories by the time the real deal third-party stands and docks hit the market. 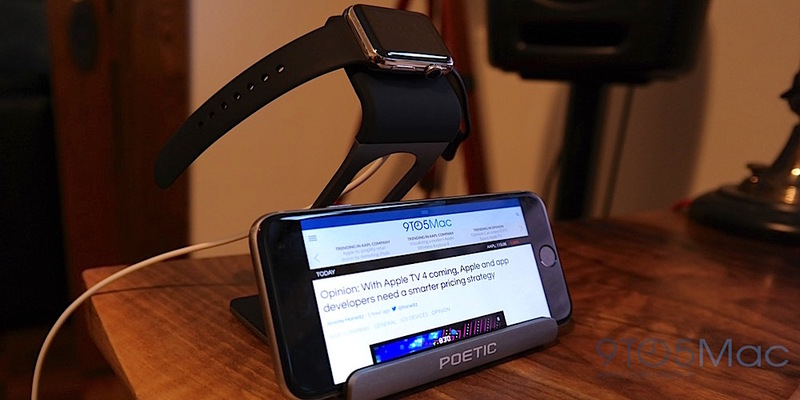 It’s at least half the cost of similar dual iPhone-Apple Watch docks from bigger brands, and before accessory makers get access to Apple’s charging component in bulk, there isn’t a whole lot of room for improvement when it comes to a simplistic, aluminum dock for both of your iPhone and Apple Watch. 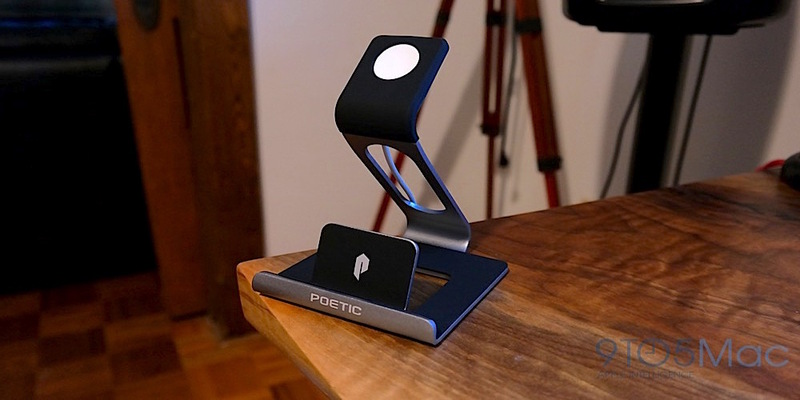 You can get the Poetic Dual Loft Stand is available for $15 on Amazon.